Global equine nutrition company Connolly’s RED MILLS welcome multi-talented Kirsty Aird to their team of RED MILLS Riders. 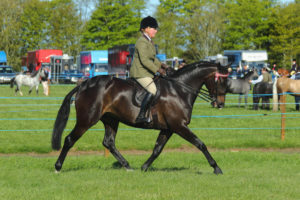 From newcomers to natives, working hunters to ridden heavy horses, Kirsty specialises in producing all types of horses and ponies in both the show and showjumping ring. Aird has contested classes at many of the top shows in the showing calendar, including Royal International, Royal Windsor, HOYS and Olympia. When she’s not producing and competing Kirsty, who is based in Scotland, enjoys teaching and judging. Having fed RED MILLS to her horses for years, Kirsty is a great advocate of the products. Aird said: “I am so pleased to be joining RED MILLS as a supported rider. Having such a variety of horses, from Connemaras to Clydesdales, it can be challenging to design a feed programme to suit their individual breed and workload. All my horses are fed Connolly’s RED MILLS Horse Care 10 Cubes and they all look and feel fantastic, it is a very versatile product. UK Head of Equine, Louise Jones, said: “We are delighted that Kirsty is joining our team of RED MILLS as a supported rider. She uses our Horse Care range, which contains our unique care package to ensure her horses get the ultimate nutritional support.